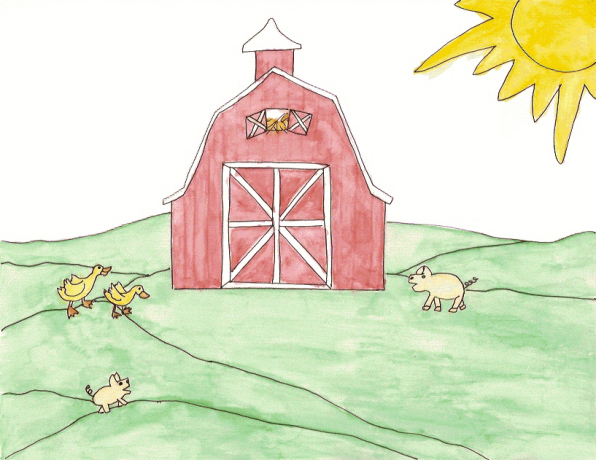 Two pigs and two ducks wandered away from their farm. The sun was out and it was such a beautiful day with blue skies and white, puffy clouds that they couldn't resist a trip to Miller's Pond. They splashed in the water and swam about, listening to the frogs croak and the dragonflies humming as they danced over the water. “I love coming to the pond in the summer,” said Perry. “It's much better than staying at the smelly old farm. I don't like sitting in the mud all day long. At least we're clean now,” said Phil. The two pigs climbed out of the pond and lay on the grass to dry off. Dora and Dina duck swam about, dipping their heads under water to catch tiny fish and larvae. “We like the pond too. We don't get much to eat at the farm, aside from chunks of apples and pears,” said Dina. “I like washing my feathers. I feel clean,” Dora said. The two ducks flew out of the water and landed next to the pigs. “I want to go home to the farm. Even if it is smelly, at least we didn't need to worry about wild animals eating us.” Dina quacked and buried her beak under her wing. “Should we try to find our way back home or should we sleep out here all night?” Perry questioned the group. “Let's go home,” said Dora. A patch of trees stood ahead of them. “I'm not going in there,” said Dora. “There's no such things as monsters,” Phil said. Perry ran to the left. Phil ran to the right. The two ducks ran back in the direction of the pond. “No!” Dora, Dina and Phil all shouted at him and ran back to the barn. “Well, I guess that answers that,” Perry said and then he joined them for a nap in the hay.